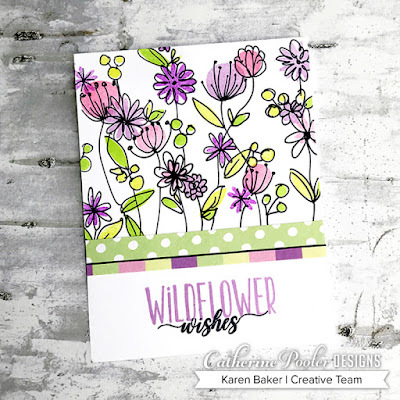 Are you ready for Catherine Pooler Designs newest release, Tropical Treasures!? There are so many awesome products released this go round, I have a feeling that you will love them all like I do! And guess what, the products from the Tropically Yours Stamp of Approval are now released as individual items as well! I'm starting off with my favorite card made from some of the many products in this release. My card base is the made from the awesome Ultra Smooth White Cardstock, which is the perfect cardstock for bases as well as die cuts, coloring, well, pretty much anything! I then adhered a strip of the new Spring in Bloom Patterned Paper, and did some inlay die cutting with another pattern from the Spring in Bloom Patterned Paper and the One in a Million Mom Floral Die. I then stamped the beautiful image from One in a Million Mom Floral Stamp Set in Royal Treatment and colored the image in with Copics. 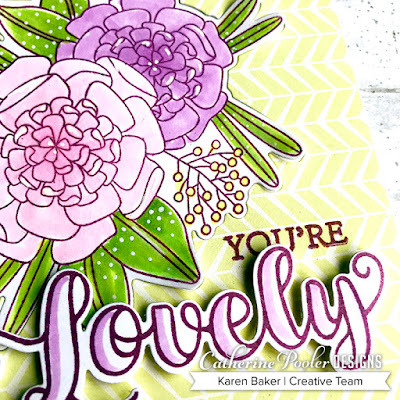 I finished the card with a sentiment and die cut sentiment from the Isn't She Lovely Stamp Set and Isn't She Lovely Die. I just love the simple elegance and flirty fun of this card. 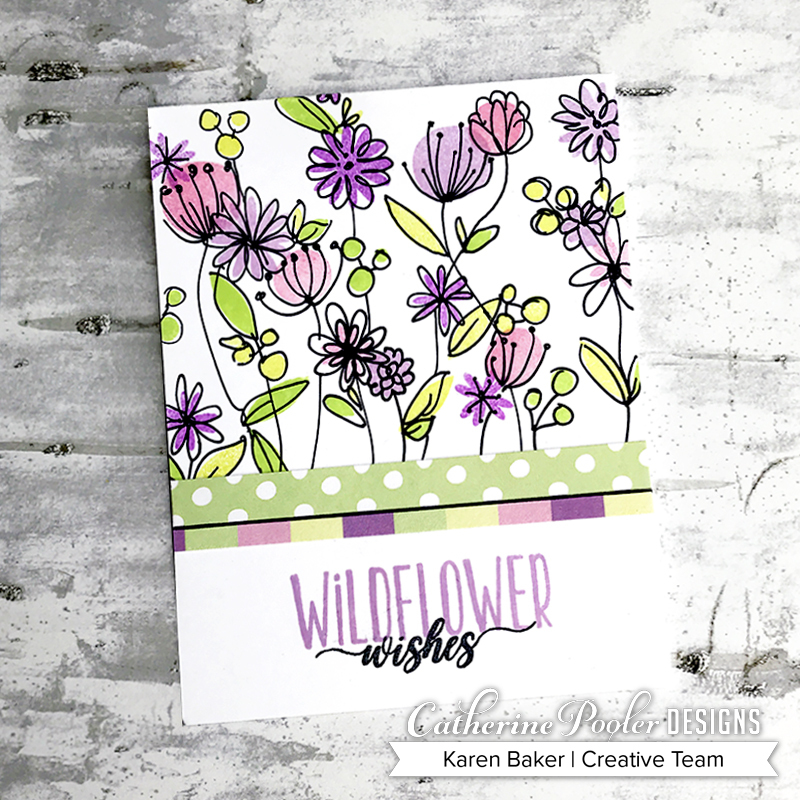 My next card also features the Spring in Bloom Patterned Paper, along with the new Be Wild Stamp Set. I started with a base of Ultra Smooth White Cardstock. I then used some flower and leaf stamps from Be Wild Stamp Set in It's a Girl, Melon Ice, Garden Party, Pixie Dust and Sweet Sixteen Inks. All of these colors were chosen because they coordinate with the colors in the Spring in Bloom Patterned Paper. I then doodled right on top of the flowers with a Tombow Dark Grey Marker. 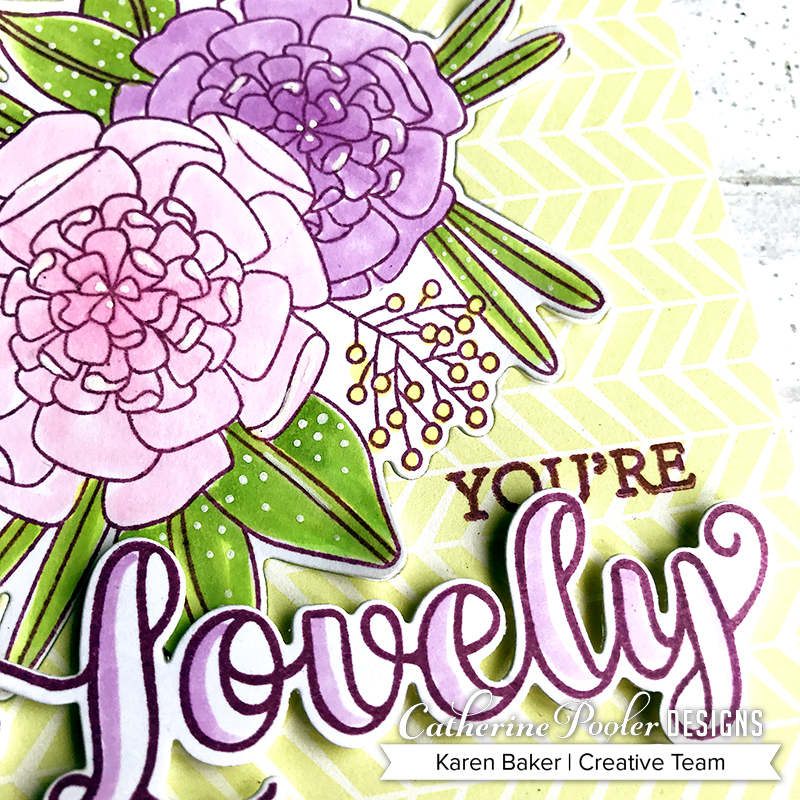 To finish the card, I selectively inked a sentiment from the Be Wild Stamp Set in Sweet Sixteen Ink, and then paired it with a selectively inked sentiment from the previously released Cottage Corsage Stamp Set. 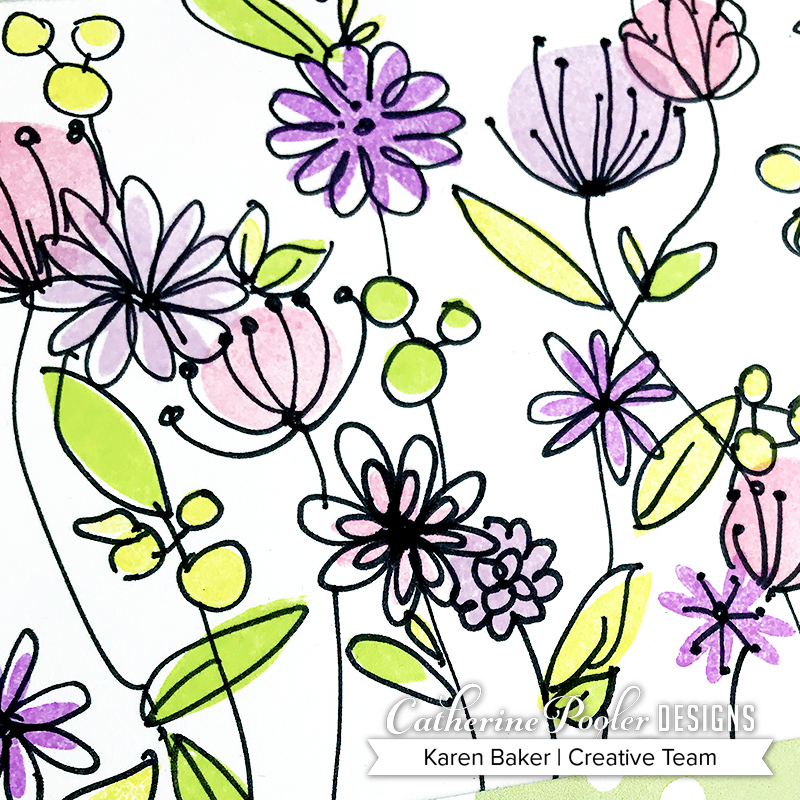 I adore that you can customize this stamp set, layer the colors, doodle, make it your own! Please be sure to hop and comment, as there are prizes! One winner will be chosen to receive a $25 gift certificate to the Catherine Pooler Store! Winners will be announced on Catherine's blog on April 1st. 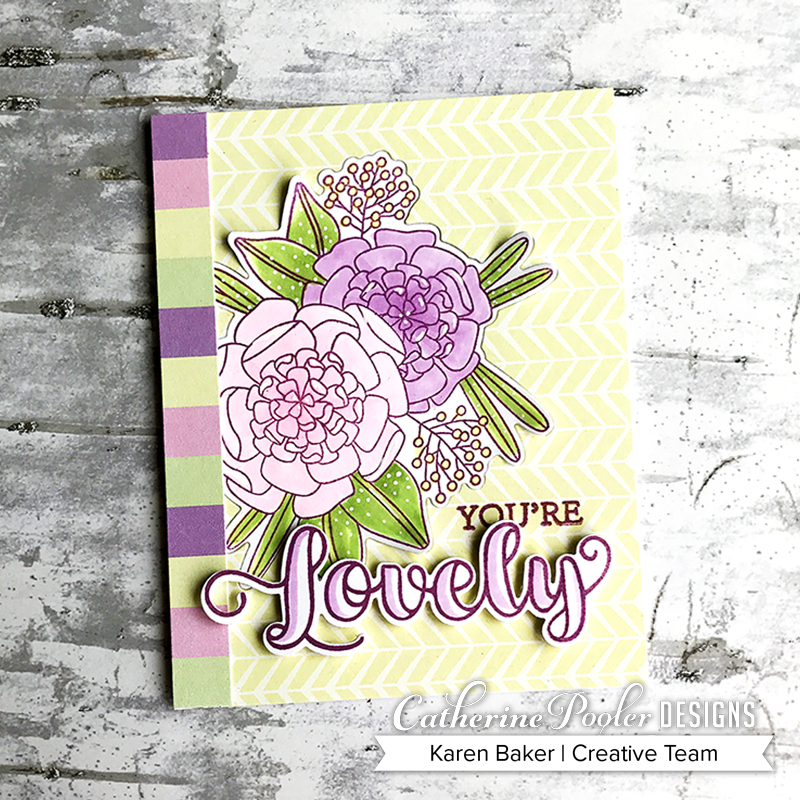 Very pretty cards, love the stamp set,Lovely and Mother's Day bundle. Those flowers are beautiful! I love the way you colored them. I love both cards, but that second one is awesome. I love what you did with that set. So imaginative and showed us truly how to use it. very pretty cards, especially your second card. Great cards! Loving the shades of purple and pink! So springlike and feminine.Love them! Pretty cards. Love the flowers on the second card. Reminds me of a field of wild flowers. Thanks for sharing! Beautiful cards! Love all the springlike colors. first are very pretty too. Lovely cards! I love the fresh garden look of the second one. Great colors! Excellent! Love your softness one the flowers. Lovely flowers! I like the color combinations! your cards are gorgeous. Love the coloring on your flowers. thanks for sharing. These are lovely Karen and I like the polka dots you've added to them both! Karen these cards are beautiful! The colour combos are awesome! Gorgeous cards! Love the floral stamps! LOVELY is right! I love your soft coloring! Gorgeous designs! I like the lovely colors on both. Very pretty cards! Great use of this set! Oh my, gorgeous cards, Karen! Thanks for sharing. Love all of these beautiful flowers! Pretty cards! Everything is sweet and colored so beautifully! Love your cards! I agree, that they are so sweet! All Girly! Thank you so much for the inspiration! Beautiful cards!! That first on is my favorite...amazing!! Oh my goodness Karen. I love your color choices. Sooooo pretty. Very pretty cards, Karen!! Love your color choices! Beautiful just beautiful!! I love the gorgeous colors you used. Spectacular cards!! Gorgeous cards. I love the soft coloring and the beautiful layouts. Beautiful cards. I follow your work on bloglovin! Welcome spring! Ooooh! I love the way these colors look together! Your cards are so pretty. I can't wait to get my hands on these new products! Love these Karen. Such pretty colors! Such pretty cards! I love them all! Beautiful cards. The second one really stands out for me. Oh so lovely! Beautiful color palette and gorgeous designs. Fantastic cards!